The Little Magpie: Tell me about it, Stud. Hellllo friends! How are we? I'm just back from Belgium and I am SO so excited to write up my guide, it's one of my favourite places I've been in a long, long time. It should be live in the next fortnight or so but I'll keep you posted! What else do I have to update you on... I saw Frightened Rabbit this weekend which was just grand. Poke is one of my favourite ever songs so it was so lovely to hear it live again, I managed to make it the whole way through without crying even once. I also made my first ever at-home-matcha-latte which was surprisingly delicious and not anywhere near as hard as I thought it was going to be (it's incredibly good with that Rude Health coconut milk, that's the real hero around here). And, last but not least, started 'Love' on Netflix after a few people recommended it! I'll keep you posted on how that one goes. Outfit-wise it's nothing groundbreaking today; my favourite dress paired with my ole favourite jacket and some comfy trainers. T'is a very 'me' outfit, though. Like I was saying, I've got lots of posts all backed up so I was thinking about maybe going crazy and doing one day this week. Is that... wild? Maybe that's wild. Okay I'm obsessed with this look!!! 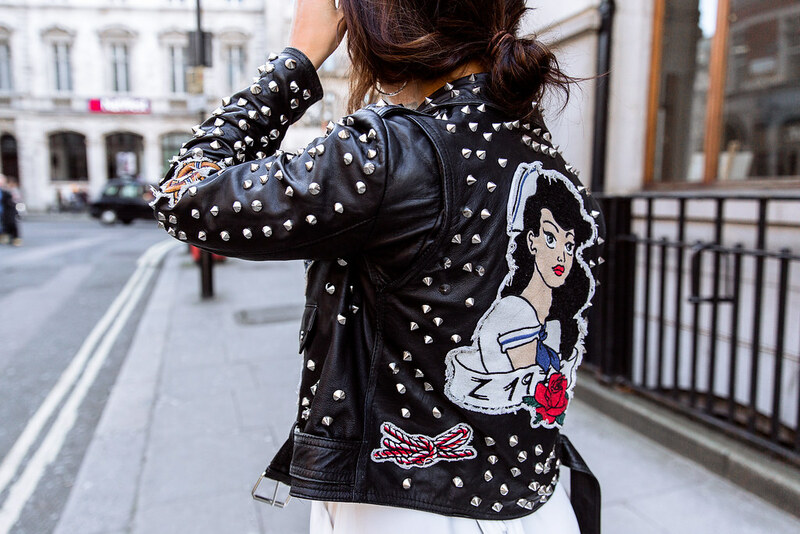 Love the way you styled this statement jacket. That look is so cool. I love the jacket. ah cant wait for the weather to improve so i can wear an outfit like this! I STILL love this jacket and I am really into the white in March ha! Yes girl, do go crazy and get posting. I want ALL the outfit inspo for Spring! P.S How beautiful are these photos? I love the dress with the biker jacket, great combo! Love this outfit so much! what a cool jacket!